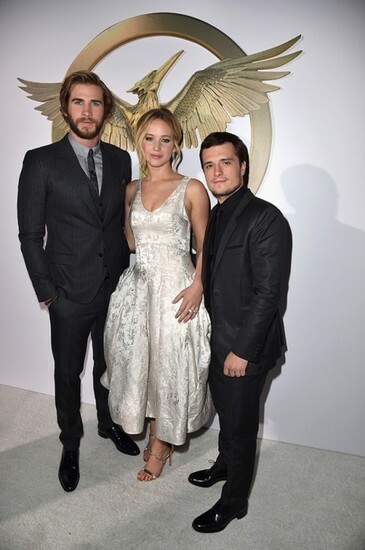 Yesterday (Nov. 17), the new Hunger Games movie, "mockingjay: part 1" premiered in Los Angeles. All the movie stars and soundtrack musicians were there. Towards the release date of the expected film, the actors of the movie series have been going to big cities around Europe and the USA to promote the newest film. The last premiere took place in Nokia Theatre in L.A.
lead star, Jennifer Lawrence and her fellow co-stars, Josh Hutcherson, Liam Hemsworth, Sam Claflin and many more, looked dazzling on the red carpet. Throughout the premier, the movie stars went around taking photos, giving autographs to the dedicated fans and doing hilarious interviews. Get your tickets to the movie now, in theaters on the 20th of November.